We are sending troops on the ground floor at the Mobile World Congress, which is officially kicking off on the 14th of February . 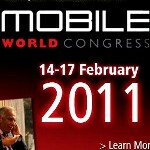 A number of cell phone companies, however, are holding pre-MWC events on the 13th, which are actually pretty major. Here we expect to see the announcement of the Sony Ericsson Xperia Play and the Sony Ericsson Xperia Neo. In the same timeframe we have Samsung, which we will be following first and foremost for the Samsung Galaxy S 2 and the Samsung Galaxy Tab 2 details. We'll be your eyes and ears at these events on Sunday, so stay tuned to PhoneArena for first-hand news and hands-on reports. wow proof read much guys? for the time those fu***ing smart phones comes out step by step just adding only one feature,i am not going to change my htc hd2.it is the easiest way for the company to grab our money,it is a smart way of marketing. They are doing such fcking features and no one deals with battery life. What about Nokia? I am getting conflicted information saying that Nokia will have a presentation today but some say it's tomorrow.